Finest commercial alarm monitoring company in Metro Atlanta, GA. The doorbell rings, and you open it to see a teenager canvassing the neighborhood with pamphlets. They’ve donned the t-shirt of a national security monitoring company, who’s sent their hourly employees to the pavement—and the hourly employee, happy to get out of the office and celebrate a day they can wear jeans to work, smiles brilliantly as you as you open the door. It’s not uncommon for national firms to send canvassers out after a local robbery. Neighborhood by neighborhood, business and homeowners buy into 3-5-year contracts as a result of the fear that burglaries are happening right around the corner. This is called reactionary marketing. In the metro Atlanta area, burglaries happen regularly. But on a neighborhood-by-neighborhood basis, this type of hyper-localized alarmist marketing is how bigger companies have been able to sign proprietors onto contracts that, realistically, are too long. We believe that the finest companies don’t have to frighten consumers into lengthy contracts. We believe that, if the service is good, a one-year contract should be long enough—because we know our clients will get everything they need from our service, and continue the contract for years to come. So, if it’s not one of the big, national companies, how do you find the finest commercial alarm monitoring company in metro Atlanta, GA? What are the related fees? …ALL the related fees? How does installation work (contractors, timing, more fees, etc.)? How big of a presence do you have in the Atlanta metro area? Whatever the commercial or residential need, the right service and system for your property in Atlanta requires a knowledge OF Atlanta. Local providers don’t send hourly canvassers into neighborhoods following crime stories. They stay in the community, and are always available to the community—in good times and bad. You’ll have the ownership available to you, and will be able to pick up the phone and talk to a professional who has real answers. It won’t be an all-or-nothing knock on the door. …No shallow customer service scripts, no time wasted. Only the finest alarm monitoring knowledge and local service. Security is a big deal in businesses, both inside and out. Do you have a retail side of your business? In retail, indoor monitoring is often more important than even outside monitoring. And if you don’t have a retail environment, internal monitoring of employees has been proven to increase accountability and enhance efficiency of workers. There’s also conditions monitoring, and added considerations for intellectual and digital property. How does our commercial alarm monitoring work? Alarm monitoring needs to be a 24/7 service, which some clients originally communicated was the source of their trepidation in hiring a local security company—what if a company was too small to have round-the-clock monitoring? Advanced Security and Fire works with COPS monitoring to ensure that eyes are on clients’ systems at all times. Even with local expertise in installation and maintenance of your systems, you can still benefit from the infrastructure provided by a larger, regional monitoring firm. 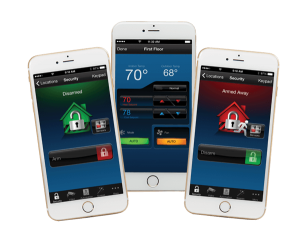 Call us today to learn more about alarm monitoring for the Atlanta area!